What do omelettes, scrambles, frittatas, huevos rancheros, custards and pasta carbonara have in common? They are all immensely satisfying, delicious creations, equally able to lift you in the morning or send you off to a peaceful sleep in front of the telly. They are also hatched from the same magical item: the egg. Imagine life without eggs. Horrible! Like a world without pillows or The Beatles back catalogue. 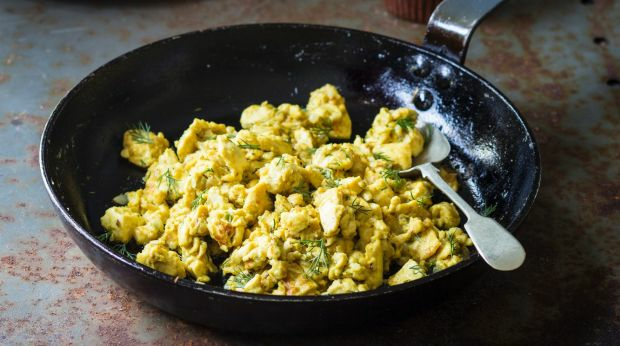 Although if we didn't have eggs, we would probably be treated to more cracking vegan dishes like the tofu scramble from Shannon Martinez included here. These are the egg dishes chefs can't live without. The dishes they're loading with Tabasco to cure a hangover or serving as supper to someone they love. The dishes they're cooking on a Sunday afternoon to recalibrate and steady the senses. Use the best eggs you can get your mitts on for these recipes (or rather the best tofu for the vegan scramble). Pasture-raised is best – a happy chicken lays happy eggs. This is my Sunday morning go-to. A bit of work goes into the salsa, but it's easy and worth it. I feel the following is the best combination of eggy, toasted, fresh and spicy but feel free to play around with the flavours. 1. Fry eggs and ham (or bacon) in a frypan while toasting the corn tortillas over an open flame. You want the tortillas to become a little charred. Make sure the eggs are seasoned and sunny-side up, and the ham has a few crisp edges. 2. Fold the tortillas and casually arrange on a plate with the eggs, ham and sliced avocado. Top with heavy amounts of the salsa picante, sliced radishes, coriander and a squeeze from the lime wedge. Scatter the fruity serrano chilli for added kick. 1. Blacken the outside of the vegetables, including the garlic, preferably over an open flame, so they are soft yet slightly undercooked. Place in a bowl, cover with cling-wrap and leave for 20 minutes. While still warm, remove blackened skin from the vegetables plus the seeds from the peppers. Using a hand blender, pulse until a chunky puree is made. Add remaining ingredients to taste and set aside. This reminds me of breakfast when I was a kid. It's pretty much the only dish Dad could prepare for us when Mum went out. 1. In a non-stick frypan, bring about three tablespoons of vegetable oil to a medium-high heat. Crack in an egg (or three or four, however many the pan can take) and fry it sunny-side up so that the white is nice and crisp but the yolk is still runny. Don't break the yolk, whatever you do. 2. When the white is cooked and before the yolk hardens, remove the egg. (Or you can do as my dad does and serve it in the pan.) Sprinkle with salt and pepper and add a dash of Maggi seasoning for an umami hit. Tear up a crispy banh mi or crunchy white baguette and dip it straight into the egg, soaking up the rich yolk and breaking off the crispy white edges. Eat. Enjoy. I used to cook this dish with the whitebait from the lake near my hometown in Verona. We recently served it as a special at 10 William Street when some good local bianchetti became available. 1. Thoroughly wash 500g of very fresh whitebait (I like to use the smallest fish possible) in a fine colander with cold running water. Spread them on paper and dry well. Return the fish to the colander and dust them with one tablespoon of plain flour. Shake them to remove any excess flour. 2. Beat two large eggs and season with salt and pepper. Add the whitebait and a handful of chopped marjoram. Heat some olive oil in a non-stick pan and pour in the egg mixture, tilting the pan so the mixture covers the base. As the frittata sets, use a heatproof plastic spatula or flat-edged wooden spoon to gently lift and stir, tilting the pan so the uncooked egg runs underneath. Cook for one to two minutes or until golden and just set underneath. The top should still be slightly runny. Carefully slide onto a serving plate. Serve immediately. Tip: I like to eat this with charred bread, fresh herbs on the side and just a little bit of grated parmesan. I love eating eggs for breakfast, bubble-and-squeak-style. I usually smash them up and use the runny yolk as a sauce. 1. Combine corned beef in a large saucepan with cloves, garlic, bay leaves and half the onion, and cover generously with cold water. Bring to the boil over a high heat. Reduce to a medium heat and simmer until corned beef is tender (1¾-2 hours). Drain, then coarsely shred meat with two forks and set aside. 2. Meanwhile, preheat oven to 200C. Combine potato, carrot and fennel in a roasting pan, drizzle with two tablespoon oil and season to taste. Toss to combine and roast until vegetables are tender (30-40 minutes) then set aside. 3. Heat remaining oil in a large frying pan over a low heat. Add remaining onion and stir occasionally until caramelised. Increase heat to medium-high, add corned beef, roasted vegetables, cavolo nero and peas. Stir frequently until golden brown (five to six minutes) and season to taste. 4. Meanwhile, bring a saucepan of water to a gentle simmer, break in eggs, in batches, and poach until soft. Remove with a slotted spoon and keep warm. Divide bubble and squeak among six plates, top each with a poached egg and serve with HP or barbecue sauce. Anyone who says they don't enjoy Bailey's Irish cream can go and sit in the corner, because they're a liar. Why eat your eggs when you can drink them? Get your priorities right this Easter. Put the craft activities down to make something you can properly enjoy. No one wants to blow a raw egg out of its shell through a hole the width of a sewing needle. 1. Combine all ingredients in a blender and blend at a low speed until smooth. Pour into clean bottles, cap tightly and store in the fridge. Copycat cream will keep up to one month. A little left of centre, but aren't all obsessions? This dish has been slowly "finessed" through the years, starting as a two-minute noodles and margarine creation I discovered through desperately seeking sustenance in my primary school days. It reached its zenith recently while I was cooking egg noodles for my daughter, Luna, and there was a request for cheese on top. Bingo! Voila! Papa's cacio e pepe! 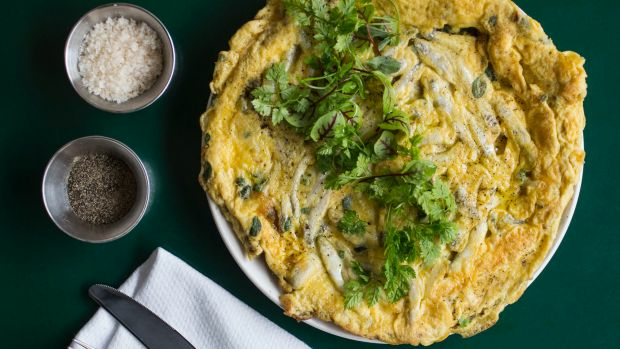 This omelette is best served as an intimate gesture as it takes a lot of care to make properly. You can substitute different ingredients to suit your taste. 1. Crack two to three eggs into a bowl and whisk until they become homogeneous and bubbles form in the mixture. (Don't season the omelette until the end – raw eggs and salt are not the best of friends.) Heat a non-stick pan on a medium-low heat, add a handful of chopped spring onions, a knob of butter and some chopped ham. When the onion is soft and some fat has rendered from the ham, add the eggs, constantly agitating the pan and pulling the coagulated eggs away from the sides until they are 90 per cent cooked. 2. Grate in some cheese (comte is best), add a pinch of salt and a few turns of black pepper. Your omelette should be soft and slightly wet, but not raw. (Avoid the theatrical pan-flip – it will result in overcooked eggs.) Roll up the omelette and slide it on to a plate. Serve to someone you care about. Carbonara would have to be one of the most comforting of foods. It's simple, rich, and bloody delicious. The perfect "day-off" food. I use our house-made guanciale to up it a notch, and amazing eggs grown just up the road. Use the best eggs you can get for both the pasta and the sauce – they're the hero of this dish. You can use pancetta if you can't find guanciale. 1. For the pasta, make a firm dough from the flour, salt, and eggs. Knead for a few minutes until it comes together, then wrap in cling-wrap or a towel and rest for one hour. After resting, roll it through a pasta machine, until the pasta is firm, shiny and elastic. Roll it out, reducing the thickness until nice and thin, and then cut 25-centimetre-long sheets. Stack these on top of each other (dust with lots of semolina so they don't stick together) and use a sharp knife to cut pasta into strips of your desired width. I like tagliatelle or linguine for this, so around five millimetres wide. 2. Boil a large pot of salted water for the pasta. In a heavy-based frypan, cook the guanciale with the garlic clove until the pork is golden and lightly crisp. Discard the garlic clove. 3. Cook the pasta in boiling salted water until al dente and drain, reserving a couple of tablespoons of cooking water to make the sauce with. 4. Add the pasta to the guanciale pan, then add the egg mix, a splash of cooking water and half the cheese. Stir vigorously and then put the lid on and leave it to sit (off the heat) for two minutes. Remove the lid and stir well. The eggs should have thickened into a glossy sauce that coats the pasta. Most importantly, there should be no scrambling! Season with black pepper before serving topped with the remaining cheese. You work with a big Latino community when you're a chef in New York City and there would always be homemade sauces, condiments and salsas coming into the kitchen. The salsa here is smoky, tomato-based and nicely spiced. Perfect for eggs. 1. Set oven to grill on the highest possible setting. On a baking tray, arrange tomatoes cut-side down with sliced onions, chillies and garlic. Grill for 20 minutes, or until the tomato and chilli skins are blackened and the garlic is nice and toasty, but don't let the onion burn. Remove from oven and cool to room temperature. 2. In a blender, combine with remaining ingredients and pulse, still leaving texture and a bit of chunk. Season liberally with salt. 1. Cook onion and garlic with oil in a medium saucepan until the onion becomes golden brown and starts to caramelise. Add beans from tin, liquid and all – the liquid will aid in the beans becoming creamy. Cook over a medium heat. Season with salt. 1. In my book, fried eggs do not include a runny yolk. Cook the daylights out of them. Crispy whites on the outside with thoroughly, but just cooked, yolk. As they're cooking, season with salt and dried chilli and when they're almost done, with lime juice and your favourite hot sauce such as Tabasco, Hartsyard Hot Sauce or Tapatio. 1. Only serve with fresh corn tortillas. White or yellow. You can cook them three ways – cover with a tea towel and whack in the microwave, heat them over the flame if you have a baking rack without a coating on it, or place them in a dry, hot pan. 2. 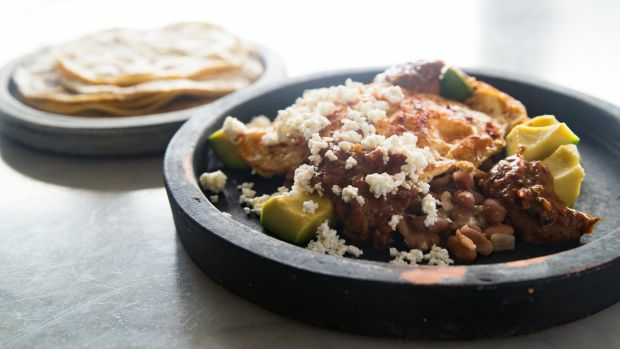 Put beans on the plate, the fried eggs on top and serve the tortillas on the side. 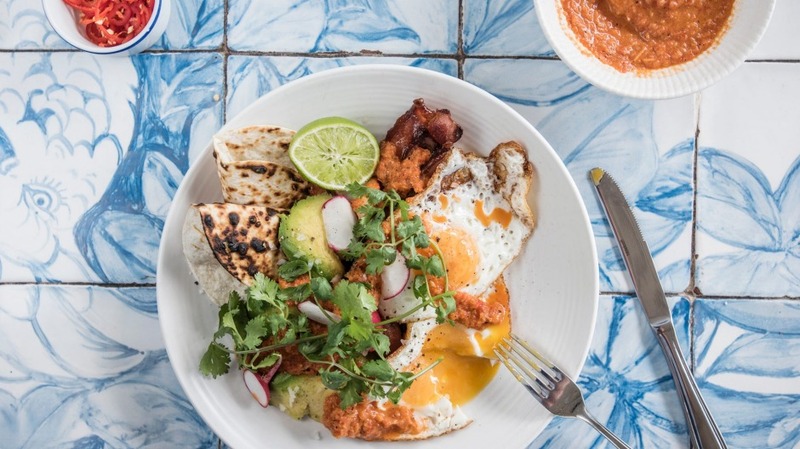 Top the eggs with your roasted tomato salsa and garnish with avocado and pickled jalapeno. (Hot tip – La Morena brand is the best pickled jalapeno in the world. We use the liquid in Bloody Marys.) If you can find queso fresco, smash it on too. Other cheese substitutes could be paneer or dried ricotta. Forget what you know about tofu. Forget what you know about tofu scramble. This scramble is award-winning. And what award is that, you say? It's the one your stomachs will give if you try it. Slap it on toast, add your favourite veg to make it more omelettey, put it in a burrito or brekkie tacos, or eat it directly from the pan. Whatever way you choose, it's perfect, so enjoy it. 1. To make the sauce, combine the flour, yeast, spices and black salt (if using) in a medium-sized saucepan over medium heat. Slowly add the soy milk, whisking constantly until you have a smooth sauce. Add the mustard and butter and whisk until thick and creamy. Reduce the heat to as low as possible and simmer, whisking often, for five minutes. Remove from the heat and set aside while you make the scramble. 2. For the scramble, heat the butter and oil in a large non-stick frying pan over high heat. Add the onion and a pinch of salt and cook, stirring occasionally, until golden brown. 3. Toss in the garlic and jalapeno and cook for about 30 seconds. 4. Add the drained, crumbled tofu and gently stir to coat in the onion mixture. Without stirring, fry the tofu until it browns slightly on one side. If you find that your tofu is letting out too much liquid and it's starting to stew instead of fry, tilt the pan and remove the liquid with a spoon. 5. Add the reserved sauce and gently fold through the tofu. Be careful not to break up the tofu too much or you'll end up with some kind of weird eggy tofu soup. Finish with a scattering of your favourite herbs. *Nutritional yeast is from health food stores, it is deactivated yeast that has a savoury, cheesey taste. See video above for Savage's 63-degree egg method. 1. Heat oil in a large pot and sweat off onions, garlic, ginger and fennel. Deglaze with mirin and reduce by half. Add mushrooms, salted kombu, kelp, and vegetable stock. Bring to the boil and skim. Reduce heat to low and simmer for 90 minutes. Strain through a fine sieve. 2. Heat a pot of water to 63 degrees Celsius (regulated is best). Place eggs, in the shell, in the pot and cook for 65 minutes. Remove from water. Crack two eggs into a soup bowl. Add the garnishes and pour over hot broth. 1. Heat wok over high heat, add the tomatoes and allow to char, tossing only when the tomato surfaces are blackened. Remove and blitz in a blender with the remaining ingredients (except the kuzu starch) and taste for seasoning. As the sauce is the seasoning component to the dish, it should be seasoned more intensely than usual. Strain via a paper coffee filter. The liquid should be bright red and relatively clear. If it isn't, simply strain via a second filter. 2. Mix the kuzu starch with 15 millilitres of cold water to form a smooth slurry. Heat the strained tomato sauce and, once boiling, add small amounts of kuzu slurry to thicken the sauce, stirring constantly and stopping once a desired sauce consistency if achieved. Keep warm. 3. For the custard, set up a steamer and wait for it to come to a boil. Reduce the steam to a medium-low heat. Blend all ingredients together with a stick blender and strain. Skim foam, pour into four small ramekins and cover with cling-wrap. Steam for six to 12 minutes or until firm with a very slight wobble. 4. Spoon a generous amount of burnt tomato sauce over the steamed custard, dress with a few drops of shellfish or chilli oil and a few sprigs of shiso if using. Serve warm.